A look into the messy problem and what's being done about it. As an "unprecedented" amount of toxic algae blooms continues to infest miles of southern Florida's coastline and waterways, many residents have been left wondering how the problem started in the first place. 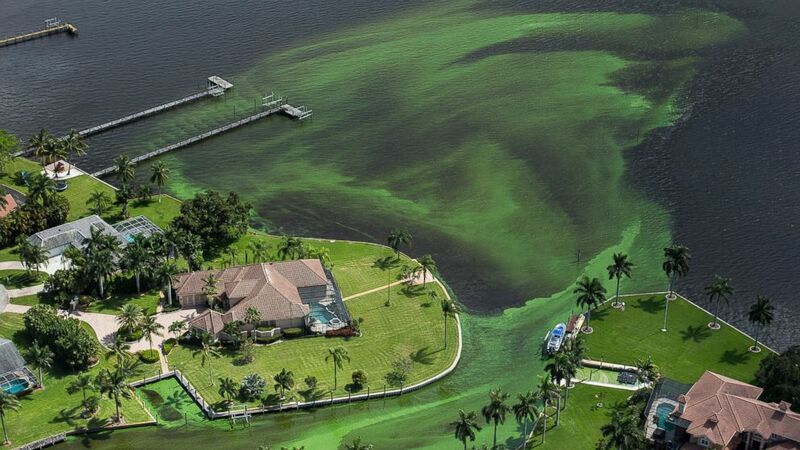 Officials believe the root of the algal blooms, which have been described as "vile"-smelling and "guacamole-thick," can be traced to Lake Okeechobee -- the nation's second largest freshwater lake and the largest lake in Florida. In recent decades, Lake Okeechobee has been been loaded with excessive amounts of nitrogen and phosphorus from a variety of sources, including fertilization runoff from farms and urbanization, according to John Campbell, spokesman for the U.S. Army Corp of Engineers Jacksonville District. Such nutrients, along with other environmental factors (such as warmer temperatures), promote the growth of blue-green algae, also known as cyanobacteria. More than two weeks ago, the U.S. Army Corps of Engineers Jacksonville District discharged a high volume of the lake's nutrient-polluted water into local canals to prevent flooding, Campbell told ABC News today. 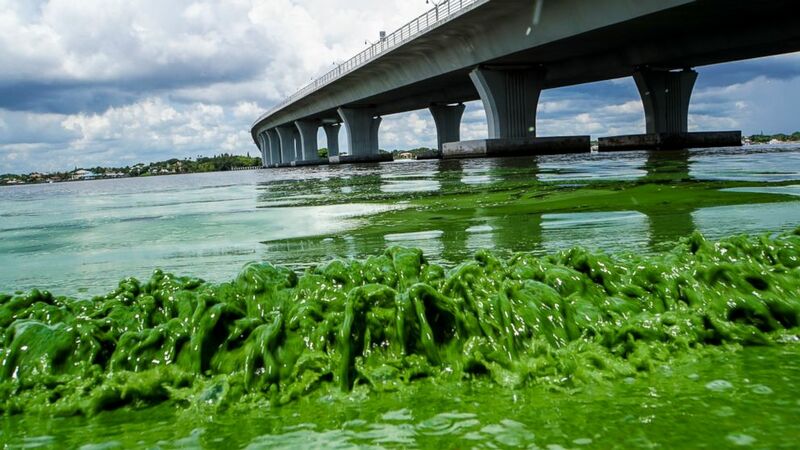 The nutrients from the released water likely contributed to the putrid algal blooms that have since been seen proliferating in canals, rivers and estuaries in four counties across southern Florida. After seeing the algae firsthand and getting numerous complaints from residents, the U.S. Army Corps of Engineers announced on Thursday it would start reducing the amount of freshwater flowing from Lake Okeechobee. However, since a number of the algae-infested canals and rivers flow into estuaries and inlets that empty into the ocean, several beaches in Martin County have also begun experiencing blue-algae blooms, according to Deborah Drum, manager of the ecosystem restoration and management division for Martin County. (Terry Spencer/AP Photo) Algae covered water at Stuart's Central Marine boat docks is thick, June 30, 2016, in Stuart, Florida. Drum told ABC News today that authorities have not yet been able to confirm if the algal blooms on the county's beaches are caused by something other than the release of nutrient-polluted water from Lake Okeechobee. However, she noted that "a recent sample of water from a beach showed that the algae there was the same species as the algae found in Lake Okeechobee and in affected estuaries." Drum said that Martin County has received dozens of calls from companies and organizations "indicating they have the technology -- whether physical, mechanical or chemical -- to remove this algae from the water." But the county is still waiting for support from the state to assess the technologies, she said. 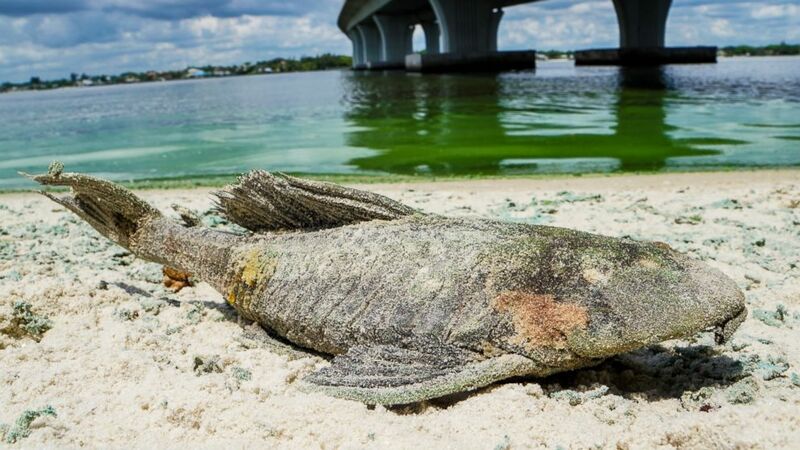 (Richard Graulich/The Palm Beach Post/AP Photo) A dead walking catfish lays on the shore with algae along Sewell's Point, Fla. on the St. Lucie River under an Ocean Boulevard bridge on June 27, 2016. 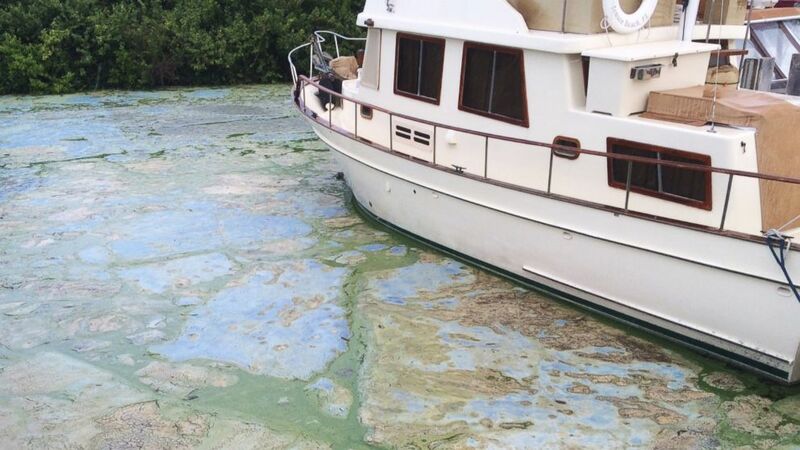 The Martin County Commission decided at an emergency meeting Tuesday to ask state and federal authorities to declare a disaster where blue-green algae has closed beaches. "The state has all these regulator requirements about what can be used, and we need their help to vet these technologies," Drum said. "In certain cases, killing blue-green algae can cause them to release more toxins, and we don't want to create worse conditions than the one we're trying to solve right now." A spokesperson for the office of Florida Gov. Rick Scott told ABC News today in a statement that the governor has taken a variety of steps "to mitigate the spread of algal blooms." (Richard Graulich/The Palm Beach Post via AP) Water full of algae laps along the Sewell's Point shore on the St. Lucie River under an Ocean Boulevard bridge, June 27, 2016. Scott "declared a state of emergency in Martin, St. Lucie, Lee and Palm Beach counties," the statement said. "The Governor also asked the Department of Environmental Protection and the Florida Fish and Wildlife Conservation Commission to take actions to address the issues caused by algal blooms in South Florida waterways, including developing a hotline for residents to report algal blooms and deploying teams of additional staff to more rapidly survey and sample areas impacted by blooms." Meanwhile, residents said they're still frustrated and concerned about the possible health problems the algae poses, and a number of them have also been spotted wearing masks in an attempt to avoid inhaling the smell released by the algae. (Greg Lovett/The Palm Beach Post via AP) An aerial photo shows blue-green algae enveloping an area along the St. Lucie River in Stuart, Fla., June 29, 2016. 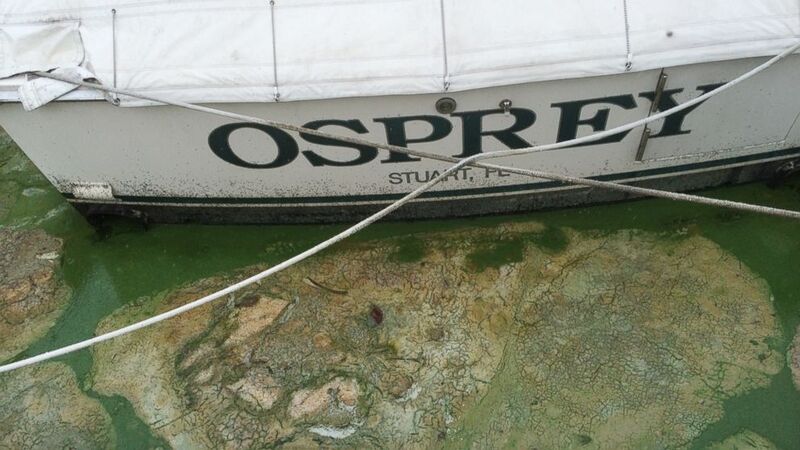 The algae "smells definitely like a toilet," one local told ABC News today. It's like "dead, rotten fish," added another. Some people have also blamed the algae for headaches, respiratory issues and even rashes. (Terry Spencer/AP Photo) Algae covered water at Stuart's Central Marine boat docks is thick on June 30, 2016, in Stuart, Fla. Officials want federal action along a stretch of Florida's Atlantic coast where the governor has declared a state of emergency over algae blooms. Health risks associated with blue-green algae occur when "people or animals are exposed to toxins that are sometimes produced by certain kinds of these organisms," according to the Florida Department of Health. "Exposure can happen through unintentionally swallowing lake or river water, breathing water spray or coming into direct contact with the blooms. At high levels, these can affect the gastrointestinal tract, liver, nervous system, and skin." The department of health added that "it is recommended that people avoid contact with all algal blooms," and that "[c]hildren and pets are especially vulnerable, so keeping them away from the water during a bloom is especially important." ABC News' Alyssa Pry, Ben Stein, Catherine Thorbecke, Eva Pilgrim and Mary Godie contributed to this report.